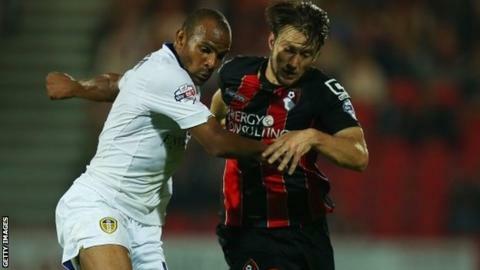 Guiseppe Bellusci and Mirco Antenucci inspired Leeds to a second-half fightback as they moved above Bournemouth in the table. Andrew Surman curled the home side ahead but despite a host of chances they could not increase their lead. Souleymane Doukara equalised before Bellusci sent a stunning long range free-kick into the top corner. Antenucci wrapped it up with a calm finish as caretaker boss Neil Redfearn remained unbeaten. Leeds goalkeeper Marco Silvestri had already made a fine save to deny Ryan Fraser when Surman hammered home his first goal since re-signing on transfer deadline day. Matt Ritchie then had two efforts saved before Callum Wilson was also denied. Leeds were far better after the break and got a deserved equaliser when Doukara finished from Tommaso Bianchi's pass. Bellusci then drilled a 30-yard free-kick into the top corner which left Lee Camp helpless. And after the wonder-strike, the stage was set for Antenucci to pick up on a Doukara through ball and round off victory. "Bournemouth showed for 30 minutes they are the best footballing team in the league, they murdered us in that period but we took confidence from only going in 1-0 down. "It was an outstanding goal from Giuseppe. I didn't see that coming, when he was lining up I thought it has got to go in or hit row Z otherwise they will break away. It was outstanding. "I am enjoying being in charge and the club is in a far better position than when I took over. The lads are playing with confidence. "I know Massimo Cellino has got a coach in mind and if he wants me to work with the new guy then great. This might be the start of something if we keep building the momentum." "We need to be more clinical but what I will say, which is unlike me, the referee was really poor for us. "We will not change our principles. For me this is the best way to play football and to get consistent results and to move the club forward. "We will not revert to long ball football and the principles will always remain while I am in charge." Match ends, Bournemouth 1, Leeds United 3. Second Half ends, Bournemouth 1, Leeds United 3. Corner, Leeds United. Conceded by Simon Francis. Attempt blocked. Simon Francis (Bournemouth) right footed shot from outside the box is blocked. Assisted by Adam Smith. Corner, Bournemouth. Conceded by Gaetano Berardi. Attempt blocked. Yann Kermorgant (Bournemouth) right footed shot from the centre of the box is blocked. Assisted by Brett Pitman with a headed pass. Goal! Bournemouth 1, Leeds United 3. Mirco Antenucci (Leeds United) right footed shot from the centre of the box to the top left corner. Assisted by Souleymane Doukara. Offside, Leeds United. Sam Byram tries a through ball, but Mirco Antenucci is caught offside. Attempt saved. Brett Pitman (Bournemouth) left footed shot from outside the box is saved in the bottom right corner. Assisted by Junior Stanislas. Substitution, Bournemouth. Brett Pitman replaces Harry Arter. Substitution, Bournemouth. Adam Smith replaces Ian Harte. Attempt saved. Yann Kermorgant (Bournemouth) header from the centre of the box is saved in the centre of the goal. Assisted by Junior Stanislas with a cross. Harry Arter (Bournemouth) is shown the yellow card for a bad foul. Gaetano Berardi (Leeds United) wins a free kick in the defensive half. Goal! Bournemouth 1, Leeds United 2. Giuseppe Bellusci (Leeds United) from a free kick with a right footed shot to the top left corner. Rodolph Austin (Leeds United) wins a free kick in the attacking half. Attempt blocked. Simon Francis (Bournemouth) right footed shot from the centre of the box is blocked. Attempt missed. Matt Ritchie (Bournemouth) left footed shot from outside the box is too high. Assisted by Junior Stanislas. Junior Stanislas (Bournemouth) wins a free kick on the left wing. Substitution, Leeds United. Sam Byram replaces Billy Sharp. Substitution, Leeds United. Liam Cooper replaces Stephen Warnock. Attempt missed. Harry Arter (Bournemouth) left footed shot from outside the box is too high. Assisted by Matt Ritchie. Jason Pearce (Leeds United) wins a free kick in the defensive half. Substitution, Bournemouth. Junior Stanislas replaces Ryan Fraser. Attempt missed. Billy Sharp (Leeds United) right footed shot from the centre of the box misses to the left. Assisted by Rodolph Austin. Goal! Bournemouth 1, Leeds United 1. Souleymane Doukara (Leeds United) right footed shot from the right side of the box to the bottom left corner. Assisted by Tommaso Bianchi. Attempt saved. Mirco Antenucci (Leeds United) right footed shot from outside the box is saved in the centre of the goal. Assisted by Tommaso Bianchi. Attempt blocked. Matt Ritchie (Bournemouth) left footed shot from the right side of the box is blocked. Assisted by Callum Wilson.